I am familiar with the venue – the National Press Club, quite well. This is one of the larger rooms to hold a press conference in. Here, instead of the standard podium image, you see the room challenges, since it’s near empty. There are two tv cameras, but beyond that, it’s empty. 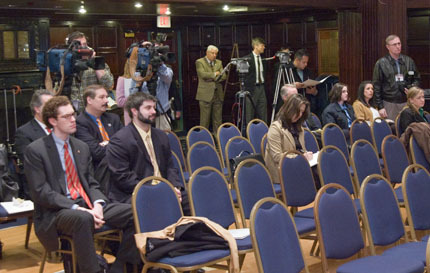 The angle towards the podium, is actually best shot from the back, down low, shooting between the shoulders of the four men on the left, so they create the appearance of a well attended event, when shot with a zoom lens. Photographing the event from all angles is important, from a documentary standpoint so that the client can see what they had, after the fact. We had to deliver images of the dias activity immediately following the event, so the digital workstation was required. We selected an image that was of the principal of the event, captioned, and moved the photo to the wires. We were successful in placing the images with the wire services, and the client garnered the exposure they wanted, as it was picked up from there with other news outlets picking up the story from the wire services.